It’s that time of year again! Just like every other year, 2013 was a pretty fantastic year for gaming. I’m curious as to what you all enjoyed the most this year. It’s looking like the big go-to nominees are Bioshock Infinite, The Last of Us, Grand Theft Auto V, Super Mario 3D World, and A Link Between Worlds. I didn’t play GTAV, and I found both Mario and Zelda to be pretty standard fare for games in those respective series (of course, “standard fare” for a Mario or Zelda game is still pretty darn great). I enjoyed both The Last of Us and Bioshock Infinite, but I ultimately preferred Infinite—that was one of the most engrossing games I’ve played in a long time. I loved it. But 2013 was a weird gaming year for me due to the fact that all of my really favorite games came out in previous years, but were re-released this year. Spelunky and Hotline Miami, two games that I would easily put in my top 10 games of all time, both came out in 2012, but were ported to more platforms in 2013 where I got a chance to play them. And then there was Earthbound, which finally came to the Virtual Console this summer. You know how people always say that they wish they could wipe their memory and re-experience old Nintendo games for the first time? Playing Earthbound was like doing that. It’s the best video game adventure I’ve ever been on and is one of my favorite Nintendo games ever. …That being said, Spelunky, Hotline Miami, and Earthbound all came out prior to 2013. I was left with Bioshock Infinite. Then I played Starseed Pilgrim. 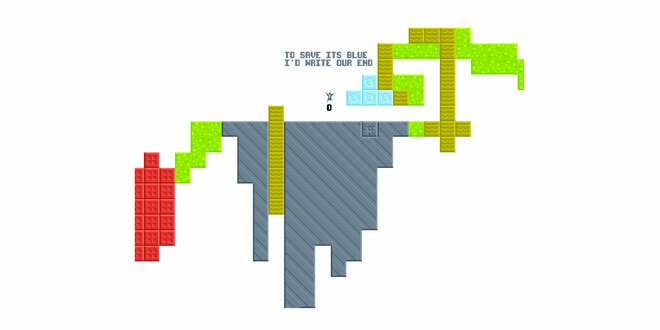 It’s a really simple (yet very deep) arcade puzzle game based around a bridge-building mechanic. It’s really hard, too. I played it for a few days, got frustrated with it, and decided to put it down. A few months later, I decided to come back to it and give it another shot. After weeks of playing it every so often (Steam says I put 15 hours into it in total), I managed to beat it. It’s a really incredibly-designed game; I’d put it up there with Little Inferno, Hotline Miami, and the BIT.TRIP series in terms of using the video game medium to tell a unique story. It’s also one of the most rewarding games I’ve ever played; the first time I “accomplished” something, my whole day was made because I was so hyped up about it. I can’t say much more without giving away what makes it so great, but if a poetic, inconspicuous puzzle game sounds like something that might be up your alley, I’d highly recommend it. So, despite how much I loved Bioshock Infinite, I’m gonna call Starseed Pilgrim my Game of the Year. As for games I didn’t get around to, I still haven’t played Dead Space 3, Assassin’s Creed IV, or Batman: Arkham Origins. I’m a pretty big fan of all three of those series, the first two in particular, and I’ve heard some great things about AC:IV (and very mixed things about Dead Space 3). I also still have yet to play FJORDS, another little indie puzzle game that I’ve heard great things about from people who’ve played it—I’ve had it described to me as a Zelda game where you start off with all your items but don’t know how to use any of them. Sounds interesting. I also played a lot of free PC games this year that really blew me away with their inventiveness, the best of which was Save the Date. I think there's a running joke on Negative World of me trying to get people to play that game and no one giving a hoot! I’m sure you’ve all heard of Candy Box by now. And if you want to see what real innovation in first-person storytelling looks like (shot fired at people who think Gone Home is the most experimental game ever made ), definitely check out The Entertainment, a short spin-off of Kentucky Route Zero. Not to mention Titan Souls, a game made in 72 hours which managed to mix Dark Souls, Shadow of the Colossus, and Gameboy Zelda into something more amazing than any of those ingredients on their own. Also, shout-out to The Stanley Parable. Oh, and The Swapper and Antichamber! And Gunpoint too! Play all those games! What about you? What were your favorite games of 2013? Anything you haven't gotten around to playing yet? Anything that really stuck out to you as being the best game of the year? Let me know! I keep going back and forth on Last of Us and BioShock Infinite. Still playing ALBW and ACIV but I doubt either of them will make a run at it for me. GTA was also great but didn't quite hit the same highs. Super Mario 3D World for me. It was just a joy to play through it...and I'm still wrapping it up. I'm still debating between The Last of Us, Mario and Zelda. I've had each of them penciled in at #1 at one time. I think I'm leaning towards The Last of Us, though. I think it's the one that impressed me the most. Unbelievable year. To be honest it's not up there in the best tier of Mario games in my eyes, but it's definitely in the 2nd tier, which ain't bad. I still haven't really played a lot of the big 2013 games though. I'm sure I made it perfectly clear my #1 game this year is POKéMON X. This is such a great series and no other game really came close to this one for me. Except for Zelda, maybe. 2013 was the year I played mostly Pokémon cards at the various local leagues... The video game I played most was Monster Hunter 3 Ultimate on the 3DS. Local co-op is such a blast & I've been hosting events where we would be up to 12 individual playing the game in the same room for 10 hours straight. Such a great game. Probably Fire Emblem Awakening. My favorite in the series. That or my usual standby, Dog Football. That game transcends the year it came out. I do hear a lot of people saying 2013 was a great year for gamers, but I didn't really feel it. The Last of Us definitely. Not as good ast he first one, but still one of the best damned games to come out of this generation. If I had to pick I guess my choice would be Super Mario 3D World. But it's really close with the four other games I mentioned. Really, my choice tends to change depending in which day you ask me. 3D World tends to be my favorite the most consistently, while Fire Emblem tends to stick to the bottom of the four. Of the games I've played, Super Mario 3D World. A Link Between Worlds might give it a run for its money though, I just started that one. A Link Between Worlds. I'd probably give my runner up to The Last of Us. Euro Truck Simulator 2 is the title that served as my personal gateway drug into the wild and wonderful world of niche vehicle sims. A crazy sub-genre dominated by tiny Eastern-European dev teams that has completely captivated me in 2103. The game sports a wonderful balance of accessibility and simulation. It's super relaxing/Zen and a great way to unwind after a stressful day at work. Also comes complete with a gorgeous game engine, which is unique in a field traditionally held down by small dev teams and budgets. ETS2 is the freshest game experience I've had in years. I have played 3 2013 games, I rank them in this order. Are these worth getting if you don't get many streetpasses?